Crazy Horse Tipi is very big! It measures 30 ft. in diameter - and it is good for a two-family or a group get-together. It is majestic! Many colorful rugs on the floor give it a nomadic flair. Two full size beds and 4-6 extra pads. - Two night minimum. The Garden Cottage is tucked away behind the flower garden right next to the creek, close to Chief Joseph Tipi and close to the bath house and the spa. It is the only dwelling we have with two single beds. - Two night minimum. The Master Bedroom Suite is located in the SE corner of the main house, right at the center of all group events. It comes with a queen size bed, a private bath, a closet and a desk - ready for a longer stay. Enjoy the sound of the creek. 2 night minimum. Chief Sitting Bull Tipi is located in the middle of the forest. It sleeps two in a queen bed under a down comforter and a buffalo hide. - There is room for a kid or two (free under 5). Enjoy the sounds and smells of the forest! - Two night minimum. 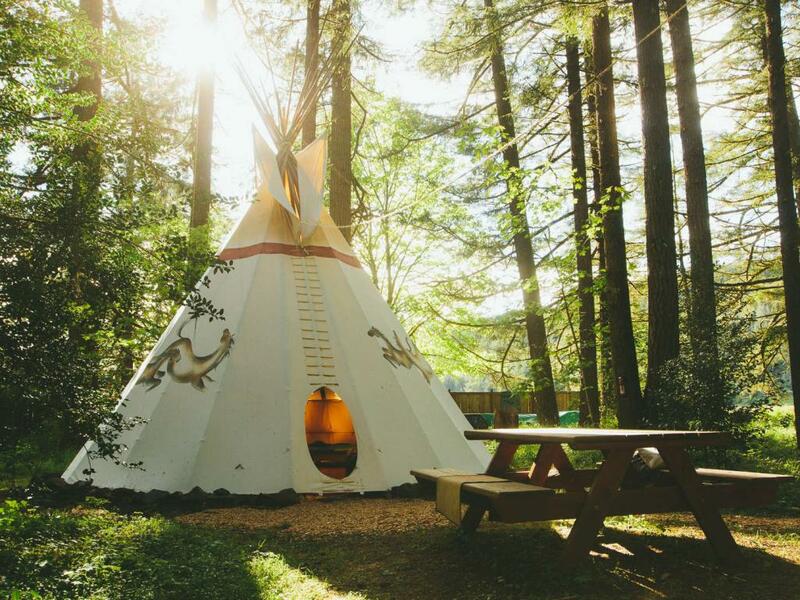 Calapooya Tipi is nestled in a cedar grove, between Sacagawea Tipi and the creek. 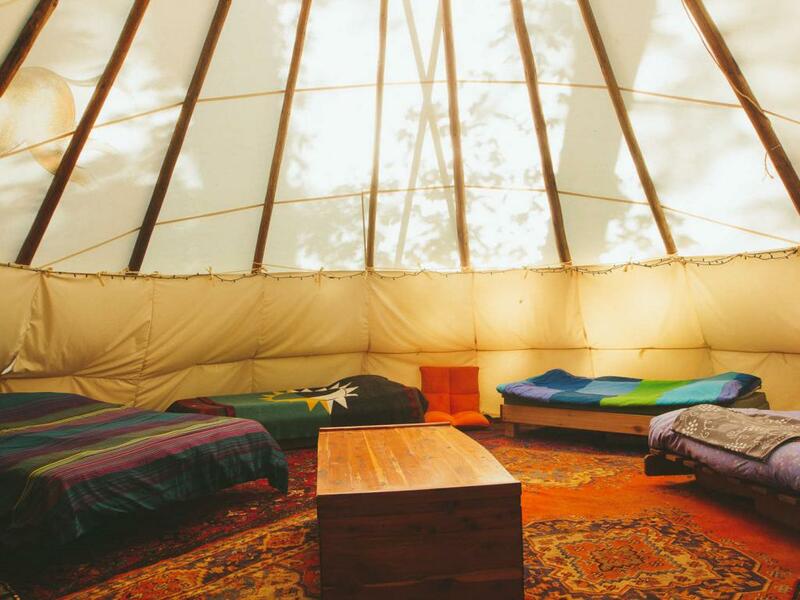 It is a beautiful and cosy painted tipi with muted light, and the sound of the flowing water. Queen bed with wool rug on stone floor. - Two night minimum. 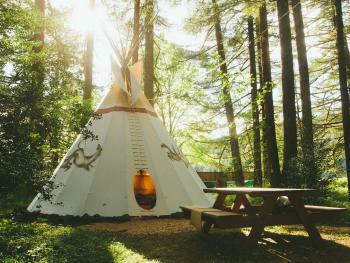 This tipi is located between the creek, the patio, the spa & the bath house, with a queen bed and possibly a child on an extra pads (free under 5). It is an all-time favorite for everyone who likes to be close to the action. Two night minimum. Hiawatha Tipi is a forest tipi - close to where the deer bed down and the wild turkeys roost for the night, between Sacagawea and Sitting Bull tipis. It is comfortable and warm, with a queen bed, stone floor and wool rug. Two night minimum. Sacagawea Tipi is in its own "neck of the woods" with a lovely view over the open fields behind the forest. Only 2-3 min. away from the bath house. Like the others she has a stone floor with wool rug and a queen bed. - Two night minimum. Our Studio above the garage is a comfortable book-lover's paradise. It is available year round, a romantic lovers' nest or a creative retreat with a queen bed, a private bathroom, cooling in the summer and heat in the winter. - Two night minimum.